Making the perfect Persian rice is a tall order. (As illustrated in detail here, here, & here!) BUT, despair not. “LET us go then, you and I,” holding hands, step-by-step, and do what it takes to crack this culinary juggernaut. Rake rice: Spread rice grains in a tray; rake with fingers to pick out unwanted bits or grit – if any. Skip this step if you have confidence in the quality of your rice. TIP: Soaking rice overnight is a good way to get a head-start and is a common practice. Bring 8 cups of water + 2 tablespoons of salt to a vigorous boil. Dip bowl of rice into the boiling water, releasing grains into the pot. As rice is boiling, stir a few times, gently, with the spatula to loosen any stuck grains; and also use the spatula to skim & discard the foam. Sample a few rice grains: if too salty, rinse rice with more water to reduce saltiness to taste. Leave rice to cool its heels in the colander while you attend to the next step. When is rice al-dente and ready to be drained in the colander? Rice is al-dente when it’s no longer crunchy but still firm – not soft or mushy. It can take anywhere from 6-12 minutes of boiling rice to get this desired al-dente texture. Precise timing varies – depending on: type of rice; geographical altitude & humidity; and a given stove’s heat settings. TIP: A test used by the novice and expert rice-maker alike is to to take a few grains as rice is boiling and either bite into or press grains between fingers to test its texture. If uncertain, best to err on the crunchy side (as it still has a fighting chance to come out alright) than over-boiled grains (pretty much done for as far as that whole fluffy business goes.) But ultimately: No Worries! Practice makes perfect and here’s a huge silver-lining even if you make a mistake: the rice will still be quite delicious! Wash and dry the pot you used to boil the rice. Combine 3 tablespoons of olive oil and 1/2 cup of water in the pot and heat till ab va roghan (the oil & water liquid, that is) is sizzling hot. Once sizzling, remove pot from the stove and set on a counter. 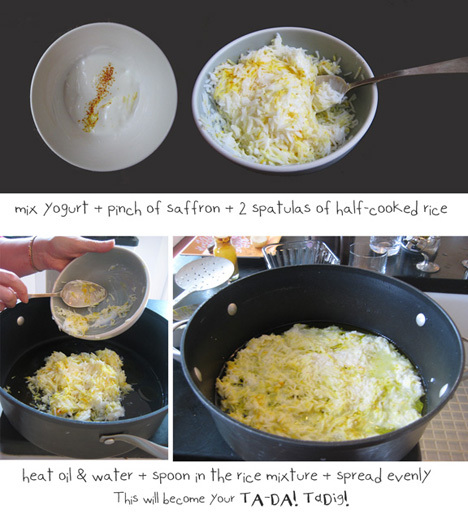 Promptly spoon in the yogurt+saffron+rice mixture, and gently and evenly spread it with a spatula. This bottom-of-the-pot-mixture (if all goes well and the almighty force is with you) will become your glorious golden crispy (TA-DA!) … TADIG. 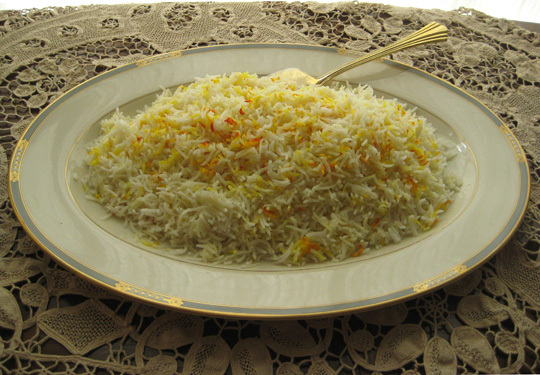 The yogurt and saffron and rice mixture is a good and oft-used base for making a nicely-colored, tasty tadig. It is also common practice to make tadig using either sliced potatoes or lavash bread (a type of flat bread.) Additionally, there are some interesting albeit off-the-beaten-path tadig bases as well. Much more to be said on this topic! The tasty oeuvre and delicate art of tadig-making to be covered with due deference and in loving detail at a later time. With the tadig-mixture in place, layer the rest of the rice in the pot; either spatula by spatula, or by tilting the colander and gradually pouring the rice into the pot. Dig several wells in the mound of rice using your spatula’s handle: one in the center, and a few around it. Cook on *medium-high* heat for 10-12 minutes until steam rises. (The traditional test to find out if rice has sufficiently steamed is to wet index fingertips and touch the pot: if the contact touch makes a nice “bizzzzzzz” sound that means the rice is indeed steaming.) While this is happening, heat 3-4 tablespoons of oil or butter or ghee. Meanwhile, rinse a kitchen cloth and spread it out on a counter-top. Place the pot on this damp dishcloth — the contact touch will hopefully make a nice “fiiiiissssss” sound. That’s a good sign! Leave pot to cool on this damp surface for 5 minutes. While rice is cooling off, dissolve a pinch or two of saffron in 2-4 tablespoons of hot water in a medium sized bowl. Remove the lid – finally! Inhale the perfection of your handiwork but don’t get too entranced because there’s still a bit of work left to do. Namely: Add a spatula of rice to the bowl of saffron-water you just made and gently mix. Set this saffron-colored-rice aside for now to use just a bit later as garnish for the rice. Pile rice up in a serving platter – one spatula at a time, working your way from the top of the mound and not disturbing the tadig – and cajole rice in the shape of a hilltop mound. 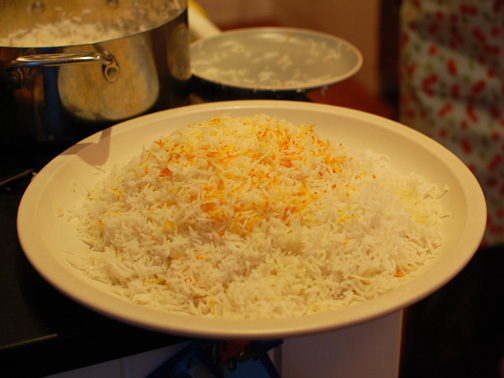 Now take that saffron-colored-rice-mixture you made earlier and evenly sprinkle it over the rice as a pretty garnish. Optional: At this point, those wishing for a heightened degree of decadence may douse 2 or more tablespoons of melted butter over the rice. My mom almost always does this — and her eyes sparkle when she explains how this step gives “such a beautiful sheen” to the final dish. Finally, it’s ta-da tadig time! Use the spatula/kafgir to detach and extradite tadig to its own platter to be served alongside with the fluffy rice. Try not to crush tadig into too many pieces, if possible. I went into excruciating detail so that you know all the ins and outs (what we Persians call “khamoo va cham”) of the intricately-protocoled-method of Persian rice making so as to increase your odds of success. For those of you new to this admittedly technique-driven process, I hope I haven’t overwhelmed you — and would like to reassure you that the learning curve is truly not steep. It’s simply a question of practicing a few times and building expertise and body memory and before you know it, the entire thing becomes second nature to you. This brings our Persian rice polo making odyssey (my, it was a long journey) to an end of sorts, but not to “The End” — there’s still the matter of kateh (the easy but non-slutty cousin of polo) and an “All About Tadig” post, and a post about how to hack a plain polo into something quite fancy; and finally a post about making rice with electric cookers. But frankly my dears, I’ve had it with writing about rice and need to chillax and take a break from it; and this here is a good place to put up the tent and camp out for a leisurely & thoughtful spell of a “berenj” sabbatical. Meanwhile, go forth and make polo! Wonderful post! Thank you so much for taking the time to explain all these steps, PLUS it is so much fun to read you! Darya, I hope that this will help you to tackle your fear of Persian rice making. I KNOW you can do it! Now everyone can make delicious Persian rice. Great post!! I hope so and thank you dear Suzanne! I love reading your details and seeing all the pictures too. The tadig sounds so so delicious with this rice! I also appreciate meticulous instructions when they are important. Wish we could meet in one of our kitchens and do some cooking! It IS quite a to-do … but end result is worth the fuss. I promise! Wow Azita, you are such a great teacher! I love the step by step instructions. Thanks so much for sharing your treasured recipes. That’s a great compliment and one that makes me very happy. Thank you Lizzy! “Smoosh”? Now you’ll have to add a glossary. A word worthy of Lewis Carroll. Hi Ross!!! Wait, so smoosh is not a word yet? It’s so descriptive I’m sure it must be in usage already. Crush + make smooth? The great thing about the neologism is that it is understandable.”Your pot has many ladles” or something like that, I’m sure there’s an expression in Farsi or Arabic or Dari like that. Ross, you had me running to Webster to find out what neologism means. It’s a big word for me, ha ha! Appropriately enough, it’s a new word to me. I like it! But guess what, I Googled it and smoosh IS a word in the common parlance here in the U.S. so while I’d be happy to take credit for its invention, I’m afraid I can’t. Wow, can you send some over?? So want to try this without wrecking my kitchen, as I’m wont to do. Well, it’s partly as my kitchen seems as if it came directly from a small, unwanted caravan. Will have to get my head around this at some stage and try it 🙂 Sounds truly amazing! ooh I was worried all the detail was going to make it seem much more daunting than it is. You can do it Johnny: wash rice, boil rice, steam rice. C’est tout. (plus 1001 details granted.) I would love to send some over in any case. Bartering for any number of your tempting fare. How did you know apartment blocks in Iran were built with rice? ha ha, kidding. I know where you are coming from and hear you loud and clear but see the comment above: the details make it appear to be a much more arduous task than it is. I wish I could smell what you’re smelling, and taste what you’re tasting! I wish I could share! Somebody amongst us should initiate a little weekend blogger get-together cookout. That looks delicious! I can almost smell it!!! Is it also served with a yoghurt based ‘raita’? I had to look up raita to give you a semi-intelligent response and my verdict is that yes, the rice could be quite nice with a yogurt based raita. If you want a quickie but delicious veggie pairing, try this: cook lentils seasoned with cinnamon, and sautee some dates and raisin and perhaps walnuts if you want as well; and then when serving rice layer serving plat with two spatulas of rice and then a layer of lentils & the dates+raisin+walnut mixture and repeat; reserving some of the dates/raisins to garnish on top, douse the entire thing with a dollop or two of ghee or butter and eat either as is or with some yogurt. It will be spectacularly delicious. We call this “addas polo” or “lentil rice” and while it’s generally served with some type of animal protein, the veggie version of it is also quite prevalent and popular. If you make it – in advance: Nooshe jaan!!! Sorry, Azita…I just assume that most people know these terms, as Indian food is popular. Plus North Indian food (Mughlai cuisine) has so many links to Persian cuisine. I thought your polo would also be served with yoghurt. Oh no! I feel your pain: I was making an animated fireworks GIF for the 4th of July then Photoshop “quit unexpectedly” and there went my hour of work. That’s sad! Your animations are so beautiful….didn’t realize that it took hours of work. Good tip – I’ll try that the next time I cook come rice. I know isn’t it amazing that various cultures and traditions or even homes as you say put a different spin on the same basic ingredient? Cooking is really an amazing human endeavor. Good luck and many beautiful adventures ahead with the rest of your odyssey! My boyfriend’s grandmother makes the most delicious taadig–my boyfriend and his mom fight over the last piece every single time. So I’ve tried to make it but the bottom keeps coming out soft / bendable rather than crispy although the rice is still fluffy and good. It is true that I don’t steam it for the full 90-minutes as instructed but I keep worrying the rice will overcook. So I only steam it for about 30-45-minutes. I assume the crispy part was achieved in the initial stage of cooking the taadig layer on high heat so the rest wasn’t a big deal. But I guess the high heat only browns the taadig layer and then the long steaming is what makes it crispy? For some reason I want to understand the science behind making taadig. I love all Iranian food but taadig is my favourite–along with bastaniyeh akbar mashti. Anyway, I would really appreciate your advice. I’m thinking it’s the steaming that I do wrong? I’ll take this to email so that I can write a proper response without worrying about writing a mini-novella! I really enjoyed reading your instructions on making Persian rice. Although you do mentione it in your beautifully detailed and photographed recepie, I would like to emphasize the absolute importance of the “roomy pot”. It took me a long time to finally master making the rice. When the rice is mounded in the pot there should not only be enough room around the pyramid mound but at least a couple of inches between the top of the mound and the cloth covered lid to allow for proper steam circulation. We always made bread/lavsh tahdig and i personally prefer it to the rice/yougurt mixture. Flour tortillas also make a light and crispy tahdig and they are already round and fit perfectly in the bottom of tge pot. Omit the yougurt and just make sure to get ones that are the same size as your pot. If you cant find an exact match, use one full tortilla, place it on one side and fill around it with pieces of tortilla cut to cover any bare spots. Remove the tahdig as instructed above and cut like a pie or pizza into triangles. You can either use kitchen sheers or a pizza cuter. Hi Vahram, I welcome your suggestion of the importance of a roomy pot. You are absolutely correct. I will edit the post accordingly to include this important fact. I’m planning on a tahdig post at a later time (needed a rice break!) and will keep your flour tortilla suggestion in mind. I have to say though that personally I’m a bigger fan of the basic rice/yogurt tahdig than the other varieties. That said, it’s been ages since I’ve tasted a lavash bread tahdig – so maybe I’ll change my mind. In any event, you’ve inspired me to make my next batch of rice with a flour tortilla tahdig. By the way, your gourmet meal plan sounds divine! I have a Persian boyfriend (of 10 years), and he has a couple of Persian dishes he cooks and has taught me. But I have never cooked Persian for his family (3 sisters and mother). Thanks for the very detailed in’s and out’s that will be helpful if I ever get the courage. Meanwhile, I can impress him with your tips (yogurt tadig). Thanks! Tina, I’m delighted to help you impress your beau’s family! Make the rice once just for yourself so the pressure of performance is not on – and you’ll see it’s really not that difficult. Practice does for sure make perfect however. Also, thank you for the link to Sunshine in a Bottle for the Ghee directions! I have a question regarding Tahdig. I make a good bread tahdig (with pita actually) but can’t get the rice tahdig down. I once tried adding yogurt, but it came out looking dark like tahchin, not the light golden color I’ve seen around. So I tried it without yogurt, and I got either a gloopy mess or a burned stuck on grit I had to throw away. Any tips? Hi Brisa, First of all congrats on mastering the art of bread tahdig! Not a mean feat at all! The best tip is that initially you should allow the rice to cook on medium high heat for 10-15 minutes until it steams. Once it steams (the pot sizzles to the touch if you touch it with moist finger) then add the oil and water and continue to cook on LOW heat for at least an additional 45 minutes or longer. The tricky thing about tahdig is that factors such as the thickness of your pot and how easily it transfers heat; the humidity of local; and even the oven settings can affect the length of time the rice has to cook. IF you’re getting burnt or dark tahdig then the culprit may be that it’s cooking too long on high heat before you lower the heat. My mother who has made rice for a few decades now still manages to burn her tahdig once in awhile which is just a testament that taghdig is in essence a capricious thing! So just allow yourself a few trial and error test runs till you figure out the prime timing. I love Persian rice! Is it polo or chelo? Every time I go to DC, I have to stop by Shamsiry, in Tysons Corner, VA, just outside DC. I thought they make the best rice in the world! (I mentioned this in my turnip post.) You know, you can eat it as it, with nothing on it. OMG, now I want some! Thank you for posting this, Azita. Can’t be driving 2 hrs to Shamsiry each time I crave polo. I used lavash for the tahdig for the first time yesterday. It comes in large round sheets from small Iraqi (?) baker down town. I found it not as crisp as yoghurt mix, but it browned nicely and was more of an (acceptably) chewy result. It could have been my timing estimate, midway on the scale of the Pars Kazar electric cooker, though. Some day I’ll invent a polo cooker with a glass bottom. I discovered Lal Qilla Basmati rice, “Prestige–2 years aged” in an Indian supplier and it worked beautifully. Dear Ross, a polo-cooker w/glass bottom sounds genius! Please do invent it! Really enjoyed reading your update about Persian rice making. Thank you for sharing. It’s true that with lavash, the tadigh comes out thinner and less crispy. It should still be somewhat crispy though, in fact, just tonight enjoyed a wonderful batch of such tadig. Agreed that it’s a good bit of work Celeste, but it’s worth it I must say. There’s a shortcut version we call “kateh” which hopefully I’ll get around posting soon. What a lovely comment & thank you for sharing your story! I do hear you re the rice, its mastery can prove elusive! I do hope the recipe works out for you. Hi! Thank you for your sweet comment. You really must explore the glory that is tadig! 😉 You won’t regret the effort. I found your link on pintrest and am so excited. I lived in Iran twice as child/teenager and never learned to make the rice. I’ve tried every way possible and it never compares… Can’t wait to try this! No if I just had some lamb strips to go over it. Forgive the belated response. I’m so interested to read that you lived in Iran a few times. Would LOVE to know more. Do you have any photos/memories you’d like to share? In any event, how did it go with making the rice? Hope it somehow and somewhat resembled the rice of your childhood. If you have any questions, don’t hesitate to ask, and do keep in touch! Great post, wish I had spotted it before. Love the passion and can’t wait to cook it! Quick question with re Step 5 # 3 should we just replace the lid or the towel also? If with the towel do we keep the towel till we lift the lid again? Sorry for the delayed response and I’m totally psyched that you are excited about embarking on a Persian rice making odyssey! Buckle up your seats! ha ha just kidding. As for your question: yes, you would keep the towel until the rice is done. You are done with the towel when you finally lift the lid (and get ready to serve) in step 6 #2. Hope this helps. Good luck with making polo and do keep me posted and maybe send me a pic, OK? Azita joon! I did it! Persian rice with tadig, fesenjan and mast chekide! Such a glorious sunday lunch all thanks to your amazing rice recipe! This post has been infected with some SPAM comments but I don’t want to close comments. If you clicked the “Notify new comments” but no longer wish to get those notification emails, I can not unsubscribe you, but you can do so on your end: Look for a “manage subscriptions” link in the footer of each email that you receive, and that will take you where you can “unsubscribe” from that thread. I’m now turning comments back on for this post. Thank you for visiting and commenting! I make this rice and you have given the method in great details. How about making this with a stainless steel pot? You can — but you have to be much more cautious re the timing so that you end up with good tahdig that doesn’t get stuck to the bottom of the pot. So short answer: yes, but be vigilant! Good luck! Try Gulbanoo Long Grain Sella Rice. This is by far the best rice suited for Persian Rice. It is very fluffy and non sticky. Although it is white rice, it has up to 75% of the goodness and nutrition of Brown rice which means you get great looking rice, gorgeous taste and aroma as well as eating health food. Excellent site! Made 3 attempts at this rice – part 1 I boiled until al dente and then put in the pot and steamed for 45 min – the reason why I didn’t cook longer is because first time it came out very dry – the texture is nice and fluffy (not dry) but its very dry and seems like its lacking moisture. So I steam for 45 min ( I skip the initial cook on high for 10 min). Any tips would be appreciated! I need to make sholeh zard for a progressive dinner. I have been searching hi and low for what kind of rice to use. You say here that Persians with no access to their native rice turn to basmati for Persian rice. Is this also true for sholeh zard? Is it possible to use jasmine rice? Hi Nicole, sorry for belated reply. I’d suggest you use the best quality rice you have available to you, & it’s definitely ok to use Jasmine rice. Good luck and noosh e joon!!! So glad to be of help. It takes awhile to master making rice in the Persian style but once you do, it’s really quite easy. Good luck! Thank you, thank you, thank you! This is so incredibly thorough. I messed up my first batch and after reading your post, I see where the mistakes were. This is by far the best teaching on making this wonderful rice and the pictures were very helpful. Thanks for taking such care in posting and paying tribute to the Persian cuisine and culture! Wow! So thorough and intense, I have been searching on how to make Persian Rice and I think this is the one! Will definitely try this! Thanks for the tutorial. Sorry for belated! Hi and did you try making the rice? Hope it worked out! Thank you for re-introducing me to the perfect Iranian rice. I lived and worked in Kermanshah in the late 70’s. I had an Armenian neighbor who taught me how to make this wonderful rice. Since returning to the states I have only made it a few times. I am definitely going to try making it again and reminisce about my wonderful time in Iran. Hi Linda, thank you for sharing your story. My father’s side of the family hails from Kermanshah actually! Hope the directions help and you end up with a perfect pot of steamed Persian rice and of course a nice bed of tadig! Thanks for going into so much detail and providing pictures! (1) How much volume of cooked rice does this result in? (3) You mention that if you stop the rice after 60 minutes, you’ll have polo (no tadig). If I want to make a plain saffron polo for the first attempt (for the interest of time too), should I simply follow the same instructions with that one adjustment? How will the yogurt-saffron mixture turn out? Should that piece still be included?…just a different texture & taste but still good? Thank you! I’m very excited to take a stab at this!